Another day, another horribly tangled skein of yarn, this one much worse than the Malabrigo sock. My Jade Sapphire silk/cashmere 2 ply from the Loopy Ewe was the worst tangled mess I’ve ever encountered. It took about two hours to untangle it by hand. I put it on the swift, wound a little, threaded the ball through the tangles, wound a little more, and untangled again. Rinse and repeat for every turn of the swift for the entire 400yd skein. It was an utter mess from start to finish. Several people on Ravelry have had tangling problems with this yarn. I emailed the company, and they offered to talk to the supplier about the tangling, and also send me a replacement skein that is already wound. Well done on the customer service Jade Sapphire, but please fix the tangling problem. 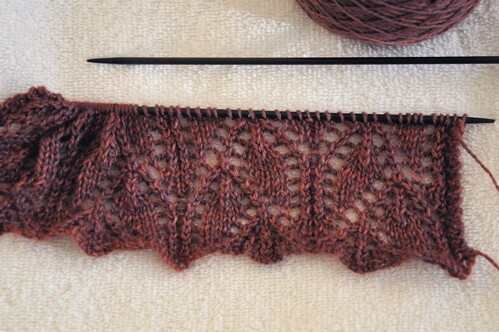 The yarn is thicker than standard laceweight, so I went up to US3 needles, breaking out the Blackthorns again. It is so nice to have needles that won’t bend or warp, no matter how hard the death grip. It also snaps very easily. I’m a little afraid to work with it, especially on high-stress days. The fabric is very soft and the pattern doesn’t require grafting, which makes me happy. Ugh. Sorry to hear about the tangles. I think if I were you I would probably have not been near so nice! I can’t stand tangling – but the color is gorgeous and the design looks amazing already!